When Jomar and I got married 6 months ago, we agreed to watch a movie at the cinema once a month (minimum). For the 5 of those 6 months, we have been watching movies at Cineplex Cinemas Marine Gateway and VIP. This month we decided to watch at Fifth Avenue Cinemas. Fifth Avenue Cinemas As the name implies, this cinema is at 5th Avenue corner Burrard. Walking distance (if you like walking) to both home and work. This location is restricted to age 19+ because they serve alcohol at the Licensed Bar and Lounge. Theater There are 5 in this location and the one we went to is smaller than I expected and it's ground level. 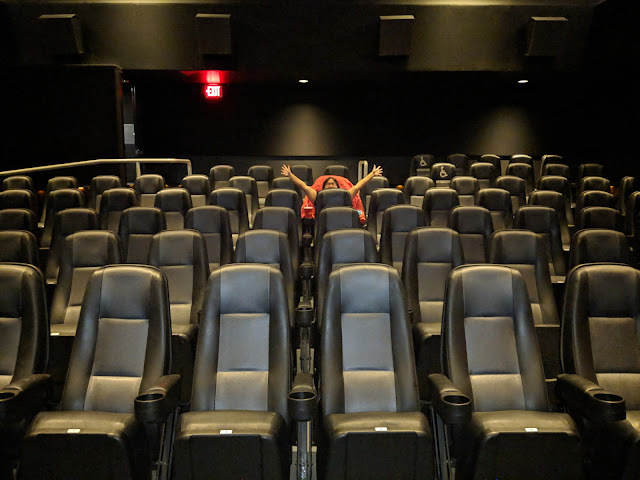 The seats were low. Food and Snack I was disappointed by the food offering. I don't know but I was expecting it to have as many food choices as they have in their Marine branch but they only serve like 9 items and even the snack bar didn't have Outtakes - only popcorn. Food was still good though. Expensive but good. I have a secret to tell you. I love KFC. I tried KFC in 4 countries (out of the 11 I've been to). KFC Philippines has the best gravy. Meanwhile, KFC Malaysia has the most flavorful spicy chicken. KFC China (at the airport) is usual (no crazy flavor when I was there. Lastly, KFC Canada has the least tasty chicken. Well, until we tried their Spicy Chicken with Waffles. Chicken and Waffles I enjoy chicken and waffles. When I go to places that offer breakfast, it's one of the things I looked for (followed by Eggs Benedict or Omelette). It's no question that Jomar and I are going to try Waffle Double Down when we saw an ad for it. The verdict? 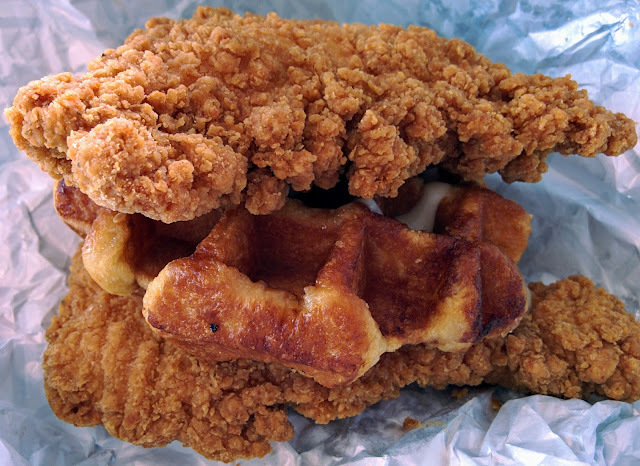 It's crunchy outside, soft inside waffle in between two crunchy, spicy, boneless fried chicken. Instead of mayonnaise, the sauce is maple syrup. It was great! Unfortunately, it's available for a limited time only so be sure to try it while it's still available. In celebration of Foursquare Day, I am starting a world tour (while staying in Metro Vancouver) with food based on the Food categories of Foursquare! You may read more about "World Food Tour" on this link. Afghan Restaurant category First on the Foursquare alphabetical list of categories is Afghan Restaurants. According to Foursquare, there are four restaurants who are categorized under Afghan Restaurants. We decided to try Afghan Chopan from the list because it's affordable and it's accessible. East is East is closer to our home and has a higher rating but the food is a mixed of Indian and Afghan food so we went to Afghan Chopan instead. Afghan Chopan Bakery and Diner It's a small place (with about 9 chairs and 3 tables) but the branch on No. 3 Road is closing permanently on April 20, 2018. They have a new branch around 10-minute walk near the Richmond Public Market at Westminster Highway. Mewtwo I caught my first Mewtwo last Friday in Pokemon GO! There were like 50 or so people at 10 in the morning on a non-working holiday in Downtown Vancouver. It was unexpected and I am impressed. Walking Downtown After the raid, we decided to walk around Downtown and it was my first time (yes, more than 2 years in Vancouver and I still haven't visited all the tourist spots) to see the Olympic Cauldron. I didn't expect it to be that big. What happened when we didn't dine out for a month? 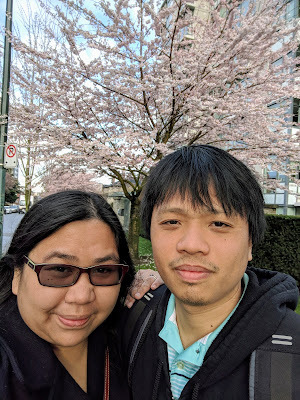 I made a post that Jomar and I are doing a one-month challenge of not eating outside food (with some exceptions) as outlined in this blog post. Below is the results after a month. Physical I lost 4.5 lbs by not eating at restaurants. I know it's not a lot. However, if you see the graph below the sudden spike mid-month is when we went to movies and decided to eat outside food (talk about poutine, burger, nachos, pop corn, and all the salty food you can think of). Financial This is the biggest change. We "saved" or didn't spend almost $400! I didn't expect that we will save that much. Or that we spent that much in eating out during January and February. When we started this, I thought that because we didn't eat out our grocery bill will double or increase but it stayed the same. So weird.